Normally I do a “Behind the Story” post on Thursdays, but I think this is much more important. Anyone who cares about books should read this article regarding the publishing industry: Publishing Ecosystem on the Brink: the Backstory. I already felt confused regarding where to get my books, and now after reading this article, I just feel even more confused. Indie Bookstores: This is my favorite place to buy books because I know I’m supporting great people. My favorite Indie Bookstore is Browseabout Books in Rehoboth, Delaware. But I don’t live in Delaware, and I only go there maybe 5 times a year. I always make a point of buying a stack of books when I’m in town, but it’s not local. I’ve yet to find an Indie Bookstore in my area to frequent. And then there’s the fact that Indie Bookstores may not always carry the book you’re looking for. Barnes & Noble and Books-a-Million: These are the two chain bookstores that I have in my area. I used to frequent Borders, and that was my favorite. But obviously that is no longer an option. BAM is cool. I’m just getting to know them now that Borders is gone. I was super impressed with how well stocked they were and bought a chunk of my Christmas gifts there. I’ve never been as big a fan of B&N. I frequently can’t find the books I’m looking for, and the store that’s near me is always crowded and terrible for browsing. But now that I realize they are Amazon’s big contender and possibly the hope of brick and mortar book stores, I feel a lot of pressure to support them and do some of my purchasing there. Then again, I also don’t have space in my tiny place to store tons of books… eBooks are more convenient. The Library: Another fantastic option. Libraries are fantastic. Librarians are some seriously cool people. And free books are a gift. But popular books often have wait lists, and then there’s the whole date due back thing. I can’t read books at my leisure. And sometimes I want to own a book. So when it all comes down to it, I feel like I’m being pulled in so many different directions when it comes to where I get my books. Do I go with what’s cheap? Do I go with what’s easy? Do I go with who I want to support? Do I really have the strength (and wallet) to boycott Amazon? I don’t know if I do. I just got a new Kindle, and I love it. And I’m just a poor teacher who makes diddly squat. So complicated. And I don’t think writing this post helped firm up any resolution on where to get my books. But maybe it helped you? Feel free to comment. I’d love to discuss and hear your thoughts! And feel free to share my post or the article! This entry was posted in Bookish Topics, e-readers, opinion. 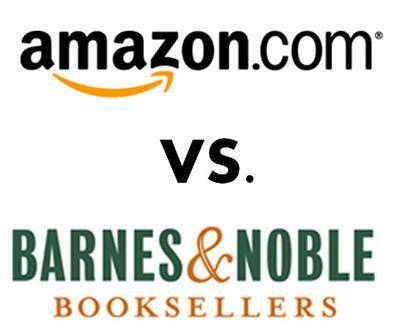 Oh goodness, I literally just put up a post about Kindle vs. Nook. I'm surprised you think Amazon is a bully because I actually like them! They are always extremely helpful. But I love B&N too! Hm…I definitely see your dilemma. I loooove actually owning the books, but e-books are so convenient. It definitely is complicated. Wish I could help more! I usually buy books I really, really want in hardback and less known books as ebooks. I don't know if that helps any. sorry But good luck! Mackenzie @ Oh, For the Love of Books! As a customer I like Amazon bunches. But the article I linked to was all about how Amazon is bullying publishers and booksellers. They have such control over the market and are wielding their power in a negative way. They are after a monopoly on the book industry, and were actively trying to eliminate brick and mortar book stores.At least that was my interpretation of the article. I get most of my books at the library. I'm a student and even working three jobs doesn't leave me as much spending money as I would like.There are some books that are must buys for me, and they generally fall into three categories:1. part of a series I've already got books to (for example, when the final Wheel of Time Book comes out, I will buy it)2. Favourite authors or sentimental value (i.e. TFIOS was always going to be a buy. I will buy all the Sailor Moon mangas)3. I read the first book in the series and I can't wait to read the second so I have to buy the second (and therefore the first, see #1) on release day. I have a feeling Pandemonium by Lauren Oliver might be one of these cases. Depends on how busy with school I am.When I do buy books, I generally get them from Chapters because they are the only book store around. I haven't been able to find any Indie stores (though honestly I haven't looked hard). I did go through a phase where I bought books at used book stores back when I was reading some older fantasy series. Not sure where those fall on the list. Somewhere between library and indie I suppose. As for your problem of wanting to use your kindle but not wanting to buy from Amazon, you could always rent e-books from your library and buy physical copies of the books you want to own somewhere else. I generally only use Amazon, just for the sheer convenience of it. I do use the library as much as I can, and I even like going to the Baltimore Book Thing some weekends—because the books are free! I probably did most of my buying through Amazon too, but now I feel a little uneasy about giving them my money knowing how they've been bullying both publishers and other booksellers. That's so weird. No one uses e-books at my library. It's usually faster to get them than it is to get a physical copy. Maybe Canada has a better system? Or maybe people from DC use eBooks more because so many of them commute by Metro? I know a lot of people have eReaders down here. Why can't book buying be simple? I'm sorry you're going through the same frustrations I am. I've had multiple times where I can't find the books I want in stores (B&N especially). Let's open a chain of stores that are trendy YA book boutiques! With sections organized by different book challenges. And coffee. Lots of coffee. And lots of book events and discussions every night. Sounds like HEAVEN to me!I really loved my Kindle until I knew more about Amazon's business practices. If Amazon would shape up and stop being such a bully, then I'd feel absolutely zero buyer's remorse!